​All of us can appreciate what might excite a dog, even to the point of tuning out his handler. It could be another dog, people approaching, food, toys, wildlife, a cat or squirrel, anticipation of a happy event like a walk or being in class. We understand that the world is full of many things our dogs may find far more interesting at times than a conversation with us. In fact, many handlers often excuse their dog's excitability. "Oh he just gets so excited when he sees another dog, he just has to go right over and say hi!" or "He just loves coming to class, and gets so excited I can't control him!" or "Whenever he sees a squirrel, he just loses his mind!" 1. The handler understands these triggers for excited, even out of control behavior. 2. The handler is probably confusing the dog. It is good that the handler understands the dog's motivation. It is not good if that empathy with the dog's feelings leads to allowing the dog to act rudely. Be empathetic to your dog's needs and desires. But be cautious as to how you let that empathy create unclear expectations for your dog. He may accidentally learn that if he's excited about seeing a dog, he will be allowed to pull you right over for a meeting. Often, the dog ends up being blamed for not having self control. In reality, the handler simply needs to have and maintain clear rules, as well as learning how to provide explicit permission signals. Create clarity in your expectations, one that helps him understand that while you recognize his needs, he needs to wait for permission from you. This is what I call "Even though..." training. It is amazing how fast dogs who have been labeled as "lacking self control" calm right down and become quite cooperative when the handler can set clear expectations. Practice "Even Though..." training and connection everywhere. What the dog learns through practice, experience & good training is that "even though...", his job is to remain connected to you. What are your specific "even though..." moments with your dog? ​Soy in Dog Food, Good or Bad? Despite ample evidence that soy in processed foods is harmful to man and beast, use of soy products continues to spread, infiltrating the ingredient lists of countless people foods and commercial pet foods as well. 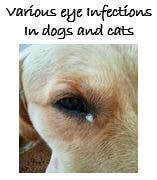 Various eye infections in dogs and care. This article full of info - the types, causes, signs, if contageous and ways to treat - a really good read.